CMI have just published an article outlining the whopping cost of our CPE outbreak, costing the hospital group in question around £1m over 10 months. We split the costs into ‘actual expenditure’, which would affect the hospital’s financial bottom line, and ‘opportunity costs’ (such as staff time and missed revenue), which can be quite tricky to account for. The large cost of the outbreak and its management accrued over a short time period make a strong financial case for investment in IPC. The outbreak occurred between 2014 and 2015, affecting 40 patients. Most were first identified by screening cultures, although a fair number first identified by screening cultures went on to have a positive clinical specimen. In the end, around half of the patients ended up with a positive clinical culture at some point during the outbreak. Once the outbreak was identified, and a package of enhanced IPC measures was implemented, there was a month-on-month reduction in the number of new cases detected. 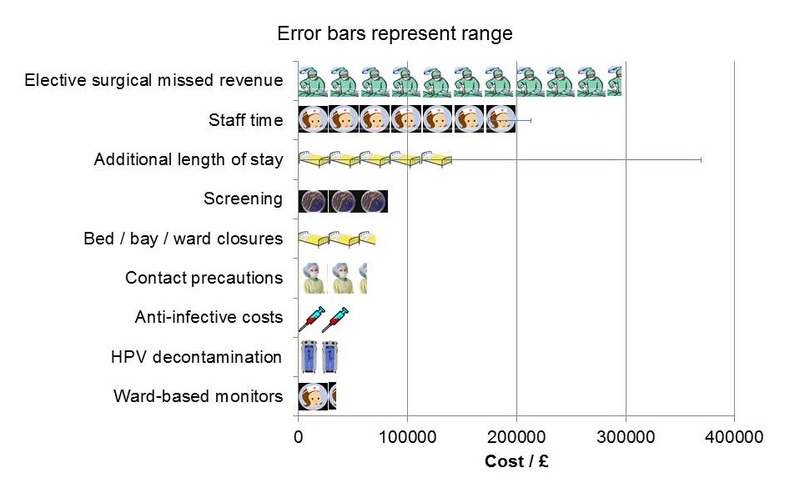 The costs were split into actual expenditure (including anti-infective costs, screening, contact precautions, ward monitors, and hydrogen peroxide vapour decon), and opportunity costs (including staff time, missed surgical revenue, and bed days). A number of these were the cost of the outbreak itself (anti-infective costs and extended length of stay for case patients), and others were the cost of managing the outbreak (screening, bed closures etc). Some estates renovations were prompted by the outbreak, but not solely for the management of CPE, so were accounted for separately (costing around £130k). The ‘headline’ cost is £1m, of which around 75% was opportunity cost, and 25% actual expenditure. The largest individual cost was elective surgical missed revenue (around £300k), followed by staff time (around £200k) (Figure 1). The largest actual expenditure was screening costs (around £80k). However, all of these would have been dwarfed by the cost of bed days if the additional length of stay (which was adjusted for ‘time dependent bias’) was at the top end of the range (approaching £400k). Figure 1: Hierarchy of costs identified. It is important to understand the relationship between ward closures and missed elective surgical revenue. There were 8 bay and 4 ward closures prompted by the outbreak. If these had not happened then there would have been virtually no missed surgical revenue, and the hospital group would have been considerably better off. Can I prove to you that these ward closures prevented transmission? No, but I do think they were a conservative course of action in a package of measures that were effective. Related to this, we took the step of implementing 24/7 ward-based monitors of hand and environmental hygiene when there was evidence of ongoing transmission despite enhanced IPC measures (taking inspiration from NIH in the US). Again, it is difficult to prove the effectiveness of this approach, which it’s fair to say was not warmly received in some quarters, but it formed part of a conservative and ultimately effective intervention. Substantial cleaning costs, which were absorbed by our contract cleaner. Litigation costs (none that we are aware of). 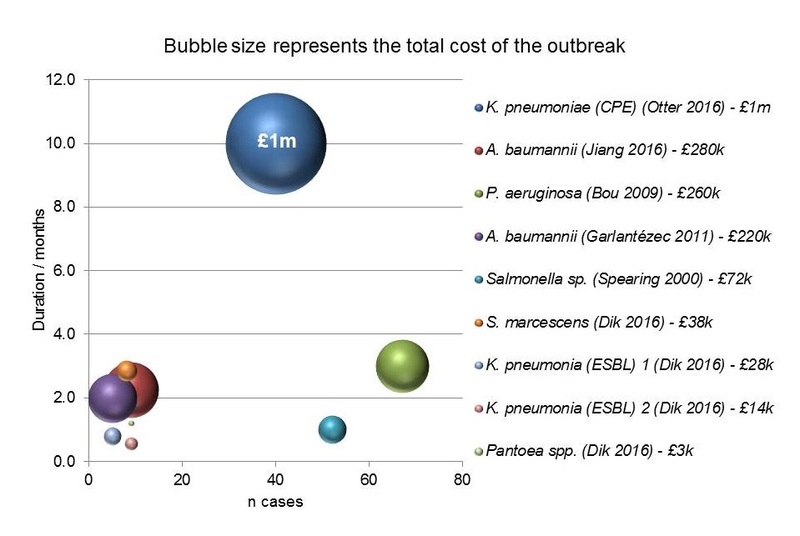 Ongoing costs outside the acute outbreak phase. Changes to the antimicrobial programme. Costs to other organisations (this economic evaluation was performed from the hospital perspective). When you compare the costs reported here with other outbreaks of Gram-negative bacteria in hospitals, it turns out that this is the most expensive Gram-negative hospital outbreak ever reported, and by some margin (Figure 2). However, we need to remember that these were outbreaks of different organisms and settings, with a large range in duration, and non-conformity in the coverage of cost categories. The more comprehensive an economic evaluation, the larger the cost is likely to be! Figure 2: The costs of hospital outbreaks of Gram-negative bacteria. These costing illustrate neatly how expensive it is to implement an aggressive control strategy directed towards CPE. However, the findings also show that if the outbreak had continued unchecked, the ongoing clinical costs of managing CPE (in anti-infective costs, and extended length of stay) would quickly have overtaken the cost of the outbreak management interventions. So, on balance, short term investment in IPC prevented long term losses. We hope that this study will prove to be useful in informing detailed cost-effectiveness evaluations in future! ← WHO guideline on SSI prevention: more clear than feasible?